Spring, 1968. My first year of bible school in Chicago. From a small town in Colorado, I was just beginning to grasp the complexity and diversity of the city. Unlike many of my classmates, to me Chicago was quite compelling and exciting. It was in Chicago where I first began to discover who I was. But I must say, when I heard the news that Martin Luther King, Jr. had been assassinated on that fateful April day, I was not too shaken up. Sad, yes, but not too distraught. Given my conservative church background and all-white childhood, I had virtually no appreciation for Dr. King’s civil rights efforts. My fundamentalist bible school certainly didn’t think much of Dr. King. He was a troublemaker, after all. Didn’t he associate with known communists? So, I have to admit I didn’t appreciate Martin Luther King, Jr. while he was alive, while he toiled in the struggles of the civil rights movement. It was not until years later, living and working in the inner city of Denver, seeing for myself the hard reality of structural racism and discrimination, did I learn to appreciate the life and words of Martin. As I considered him anew in the context of my own ministry, I realized that Dr. King represented a courageous response to the call to discipleship. Out of his life situation, as a Christian minister, he felt that to follow Jesus meant a serious engagement with the injustice, poverty, and discrimination he experienced in Alabama. Being a Christian for Martin was not just a private affair between him and God. Discipleship for Martin was a call to political and social action on behalf of others. For this reason he was a dangerous and wild presence in an unjust and racialized world. 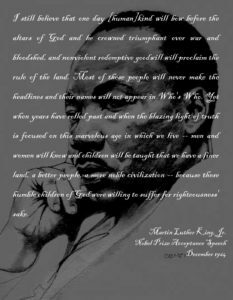 I still believe that one day [human]kind will…be crowned triumphant over war and bloodshed, and nonviolent redemptive goodwill will proclaim the rule of the land. Most of these people will never make the headlines and their names will not appear in Who’s Who. Yet when years have rolled past and when the blazing light of truth is focused on this marvelous age in which we live — men and women will know and children will be taught that we have a finer land, a better people, a more noble civilization — because these humble children of God were willing to suffer for righteousness’ sake. “A finer land, a better people, a more noble civilization”? How naïve, Martin. Have you seen what’s going on these days? We have a president who is personally undoing all of the civil rights accomplishments you fought so hard to win. We have a president who blatantly talks about people of color in the most disrespectful and vile ways. We have a president who has emboldened racists to proclaim him their champion – racist attitudes we naïvely thought were a thing of the past. Martin, do you realize that we are no closer to your “redemptive goodwill” today than in your day? Martin, it would appear that your dream of “a finer land, a better people, a more noble civilization” has a longways to go. In Martin’s very last speech, the day before he died, he promised the crowd that they would get to the Promised Land. But he also said this: “Let us move on in these powerful days, these days of challenge to make America what it ought to be. We have an opportunity to make America a better nation.” That challenge still stands. I, for one, desire to take up this challenge – to make America a better nation. I, for one, desire to be the risk-taking disciple that Martin strived to be. I, for one, will not let the dream die. Martin, thank you for inspiring me to strive for the redemptive goodwill of us all.